This Sponsorship Agreement is designed for use when an organisation wishes to sponsor an individual. a general clause detailing the scope of the agreement, waiver, severability, third party rights, governing law and assignment of rights. Two Schedules are included, allowing parties to set out the purpose of sponsorship and sponsorship rights. You need this document if you are looking to sponsor or be sponsored as an individual. This Sponsorship Agreement is designed for use when an organisation wishes to sponsor an individual. This agreement sets out the parties’ mutual rights, and their obligations towards the other. The purpose of the sponsorship and the sponsorship rights granted to the sponsor can be respectively listed in Schedules 1 and 2 of the agreement. 1. While all the wording should be checked for suitability, wording in square brackets is variable and the square brackets should be removed before the agreement is finalised following your having taken legal advice. In some cases details need to be inserted – e.g. details of the sponsorship fee, duration of the sponsorship, etc. 2. The agreement should be signed in duplicate by the sponsor’s authorised representative and by the sponsored individual (note that signature in the presence of a witness is preferable, but not strictly necessary in this case). Each of the parties should retain an original signed copy. 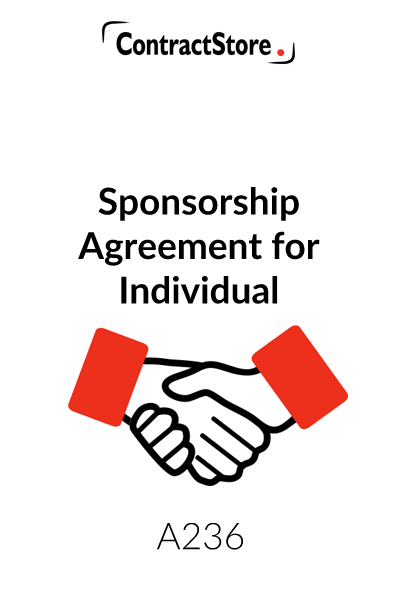 The agreement starts with an introduction referring to the individual’s intention to enter into a sponsorship relationship with the sponsor. Clause 1 defines key terms of the Agreement. You will need to insert a description of the purpose for which the individual is being sponsored in Schedule 1, and list the sponsorship rights to be received by the sponsor in Schedule 2. Clause 3.1 imposes an obligation on the sponsor to comply with all reasonable instructions given by the individual in relation to the sponsor’s usage of the sponsorship rights – these instructions would range from, for example, to visual identity and ‘brand’ signage. 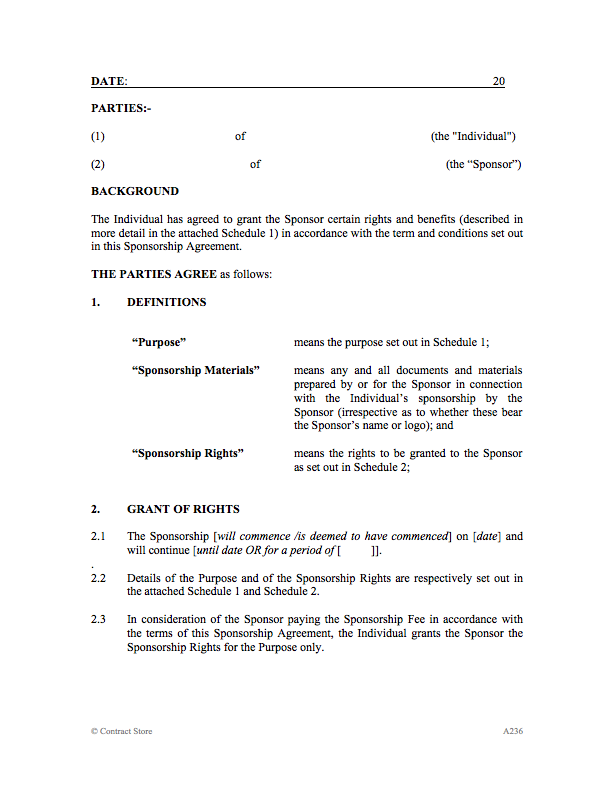 Clause 3.2 enables the individual to use the sponsor’s name in connection with his/her own promotion activities surrounding the sponsorship, as well as his/her delivery of the sponsorship rights to the sponsor. Clause 3.3 enables the individual to control the quality and content of any promotional materials prepared by the sponsor or its suppliers in connection with its sponsorship and the event itself. Clauses 3.4 to 3.6 set out an approval mechanism by the individual for all sponsor’s marketing activities in relation to the sponsorship, including the preparation of promotional materials, joint promotional activities, and online PR. Clause 3.7 is a catch-all provision designed to further ensure the sponsor will not engage in any activity which may be detrimental to the individual. Clause 4 confirms the individual’s obligation to grant the sponsorship benefits as listed in Schedule 2, and to liaise with the sponsor throughout the duration of the sponsorship when performing his/her sponsorship obligations (e.g. product endorsement, mention of sponsor in interviews, etc). Clauses 5.2 to 5.5 are standard payment obligation clauses. The sponsor is required to pay VAT in addition to the sponsorship fee. Note also the payment terms for reimbursement of expenses by the sponsor, and the credit terms which can be tailored to your requirements at clause 5.3. Clause 6.1 enables you to list at Schedule 2 those individuals who will manage the sponsorship relationship on a daily basis. Clause 8.1 limits the individual’s liability to the sponsor to direct losses suffered and to a maximum amount equal to the value of the sponsorship fee. However, the cap does not apply to the individual’s liability to the sponsor in the case of death or personal injury or other type of loss or damage caused by negligence or fraud on the part of the individual’s officers or employees. Clause 8.2 ensures that the sponsor reimburses the individual for any losses suffered by the individual as a result of the sponsor’s use or misuse of the sponsorship benefits. Clause 9 deals with the termination provisions. In addition to standard termination provisions (for a breach which cannot be or isn’t remedied, or for bankruptcy or insolvency), the individual can terminate if the sponsor is late in paying the sponsorship fee – you will need to insert your chosen credit terms as appropriate. Clause 9.2 further ensures that the sponsor pays up all money due on termination, plus any expenses or loss of profit directly resulting from the early termination. Clause 10 protects the individual if circumstances beyond his/her control prevent or hinder his/her performance under the agreement, for a specified period. This clause however enables the Sponsor to terminate the agreement if performance does not occur beyond the specified period, and to recoup the proportionate amount of the sponsorship fees it may have already paid out to the individual for that period of the contract which will now not be fulfilled owing to the force majeure event.